[Santa Clarita] – When Royal Princess debuts in June, the ship will attract attention for its many striking features, including a soaring atrium and the dramatic over-the-water SeaWalk. But what may escape immediate notice are the myriad of unique innovations throughout the ship that will enhance the Princess Cruises experience that cruisers have come to know and love. Including technological advancements, fresh entertainment offerings, new taste treats and expansions of the classic Princess experience, these new features will bring an extra level of excitement for passengers when the ship sets sail. 1. New (and Complimentary) On-Demand Stateroom Programming – A new generation of in-room television entertainment will debut aboard Royal Princess, offering an extensive array of on-demand movies and other programming options. The entire library of hundreds of movies, as well as classic and contemporary television show episodes, will be offered free to passengers. The new system will also offer a live feed from the ship’s television studio Princess Live! 2. Four Brand-New Original Production Shows – The Princess Theater aboard Royal Princess will debut four new production shows, including “Colors of the World,” an experiential journey through the destinations visited by Princess ships; “Spectacular!” a colorful music extravaganza; “Sweet Soul Music,” a tribute to rhythm and blues; and “What the World Needs Now,” an elegant show celebrating the music and style of the ‘60s. 3. Tea Tower with Sommelier and 250 Blends – Featuring a tea sommelier and a choice of 250 blends, tea lovers will revel in Royal Princess’ unique tea tower located in the ship’s central Piazza. Here passengers can enjoy pre-blended tea varieties or create their own custom flavors. The ship’s tea sommelier, an expert on tea blends, will host tea tasting events and a new Royal Afternoon Tea Experience, inspired by some of the most famous tea spots in London. 6. Flair Bartending Shows – The top-deck SeaView Bar will feature midday and sunset flair bartending shows where talented bartenders will entertain passengers with their impressive bottle-tossing and mixing skills. 7. Whiskey Flights at Wheelhouse Bar – Inspired by the growing popularity of whiskey, the line’s signature Wheelhouse Bar will feature a menu of three different whiskey flights – each featuring three whiskeys. Passengers can choose from single malts, three “Glens,” and other iconic whiskey options, each featuring tasting notes. 8. Daily Pub Lunch – Also in the Wheelhouse Bar, Princess’ popular English pub lunch will now be offered daily. Previously available only on select sea days, Royal Princess will serve the full traditional pub-style lunch on all sea days – and on port days will offer fish and chips and a ploughman’s lunch – along with signature brews. 9. Mobile Cruise Information Intranet– Princess@Sea, a brand-new mobile-friendly intranet site will enable passengers to easily access daily updates about entertainment, onboard specials, weather and port news, as well as review their onboard folio from their personal mobile or tablet devices. 10. Royal Indulgence Package – New cabanas in The Sanctuary – which offer an array of exclusive treatments in this adults-only setting with incredible ocean views – will feature customized packages that range from $320 to $3,000, the latter for a “Royal Indulgence” package for four people. This exclusive experience will provide the ultimate in pampering with all-day massages and gourmet food and beverage offerings. 11. Concierge Lounge for Suites – For the first time on a Princess ship, suite passengers can access an exclusive area to relax or work, with access to full front desk services, plus light snacks and beverages. Here, these passengers will have dedicated staff to assist with such things as shore excursions, specialty dining or Lotus Spa reservations. It will also be used as a private disembarkation lounge for suite passengers. 12. Largest Gelato Menu at Sea – Whether passengers prefer vanilla, chocolate, dulce de leche, or butter pecan, Royal Princess’ charming new gelateria will serve up the largest variety of creamy Italian-inspired gelato and ice cream creations at sea. Gelato will feature a menu of eight delicious flavors prepared by the ship’s pastry chef, plus more than 20 toppings and sauces, and specialty items such as sundaes, waffle cones and sweet crepes. 13. Sabatini’s Bites and Flights – As the line’s signature Sabatini’s Italian restaurant will be located right next to Vines on deck 5, the wine bar will now offer Sabatini’s Bites to accompany its popular wine flights. Passengers can sample small bites of such dishes as Tuscan Brochettes, Beef Carpaccio and Lamb Chop Lollipops. 14. Largest Outdoor Movie Screen at Sea – Princess was the first cruise line to introduce this innovative offering in 2004. Aboard Royal Princess, not only is the Movies Under the Stars screen 30 percent larger than our current screens, it will be the largest at sea. 15. Touch Screen Photo Finder with Facial Recognition Technology – The Royal Princess photo gallery will feature digital kiosks that use facial recognition technology to help passengers find all of their photographs. Passengers can save favorites, customize prints, and take advantage of special packages, all from the convenience of the kiosk. 16. Princess Live! All Day Programming – The new television studio aboard Royal Princess, a first for Princess, will be a lively place, featuring programming throughout the day from 8 am until midnight. Passengers will enjoy live talk shows, demonstrations and performers here, including the daily Wake Show. With seating for just under 300, the space will give passengers a more intimate opportunity to meet the ship’s entertainers, play games and enjoy refreshments with the dedicated café. 17. Four Different Water and Music Shows – The ship’s central pool area will feature daily and nightly performances of four separate themed sequences comprising dancing fountains, special music and live performers. The Movies Under the Stars screen will also be incorporated as an additional show element. 18. Largest Collection of Super Tuscan Wines at Sea – More than 20 choices of these headline-making wines from Tuscany will be available in Sabatini’s. Ranging from recognizable Super Tuscans such as Masseto, Solaia or Tignanello to some lesser known vintages such as Castello del Terricio ‘Cappuanino’ or Il Bruciato Bolgheri, these wines will be featured by the bottle and in a new Sabatini’s Super Tuscan Wine Tasting event, where passengers can enjoy the rare opportunity to sample the wines accompanied by delicious small plates from the Italian restaurant. 19. Largest Complimentary Pizza Restaurant at Sea – Alfredo’s Pizzeria, already a passenger favorite on several vessels, will take Princess’ reputation for serving the best pizza at sea to a new level. With 121 seats, Alfredo’s aboard Royal Princess will be the largest such pizza restaurant at sea, and will feature an expanded menu of freshly prepared Neapolitan-style pizzas, calzones, flatbreads and baked pasta. 20. Princess’ Greenest Ship – Royal Princess has been designed to improve energy efficiency and reduce carbon emissions, making it the line’s greenest ship. Some of the key areas of focus include the ship’s extremely efficient hull and propeller design, which requires the same energy as the line’s smaller ships to drive it; a distributed air conditioning system with a large number of fan coil units rather than a centralized system; usage of low energy lighting throughout the ship with an emphasis on LED; the addition of variable speed drives to the biggest electrical consumers such as ventilation fans; a tunnel washer in the laundry which will reduce water consumption; and the introduction of additional monitoring of the ship’s overall energy usage. The 3,600-passenger Royal Princess is a new-generation ship for Princess Cruises. Among the special features found on board will be a greatly expanded atrium, the social hub of the ship; a dramatic over-water SeaWalk, a top-deck glass-bottomed walkway extending more than 28 feet beyond the edge of the vessel; plush private poolside cabanas that appear to be floating on the water; the new Princess Live! television studio; a pastry shop; a special Chef’s Table Lumiere, a private dining experience that surrounds diners in a curtain of light; and balconies on all outside staterooms. The ship’s 2013 maiden season will include cruises on the line’s signature Grand Mediterranean itinerary throughout the summer, followed by Eastern Caribbean cruises beginning in the fall. More information and video previews of the ship are available at www.princess.com/royalprincess. Additional information about Princess Cruises is available through a professional travel agent, by calling 1-800-PRINCESS, or by visiting the company’s website at www.princess.com. One of the best-known names in cruising, Princess Cruises is a global cruise and tour company operating a fleet of 16 modern ships renowned for their innovative design and wide array of choices in dining, entertainment and amenities, all provided in an environment of exceptional customer service. 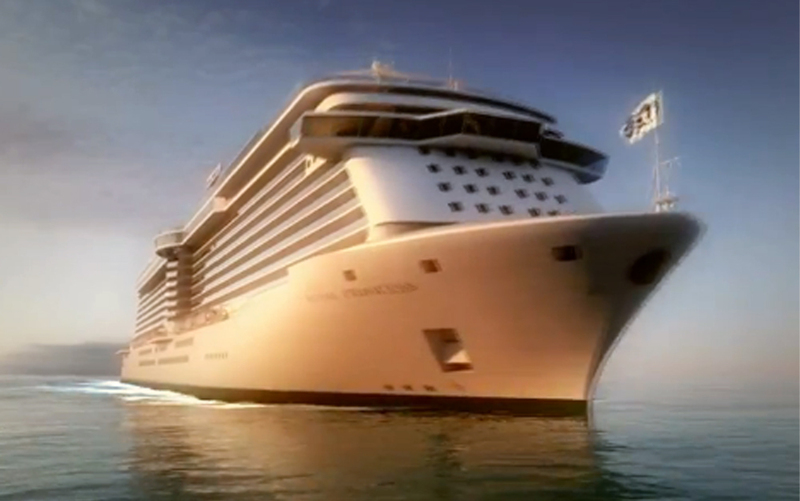 Following the debut of Royal Princess this year, sister ship Regal Princess will debut in 2014. A recognized leader in worldwide cruising, Princess carries 1.3 million passengers each year to destinations around the globe ranging in length from three to 107 days. The company is part of Carnival Corporation & plc. What about engines that don’t catch on fire, leaving passengers stranded. Or how about elimination of shipboard food borne viruses.